With each step a dark splash of sand surfaced through the snow. Cold, moist air engulfed me as the low winter sky reached long, probing fingers through the passageways of the giant sandstone escarpment. The snow began again, pulling plumes of icy vapor down with it, obscuring the tops of the curved rock walls above me. Beyond a short narrows the canyon flared wider to follow the broad, meandering bends of the dry streambed. Clumps of withered grass and dried, brown stalks stood alongside the fractured remains of fallen boulders while white drifts filled in the small ledges and contours on the walls. Slowly, the few small trees became draped in a pure, soft blanket. 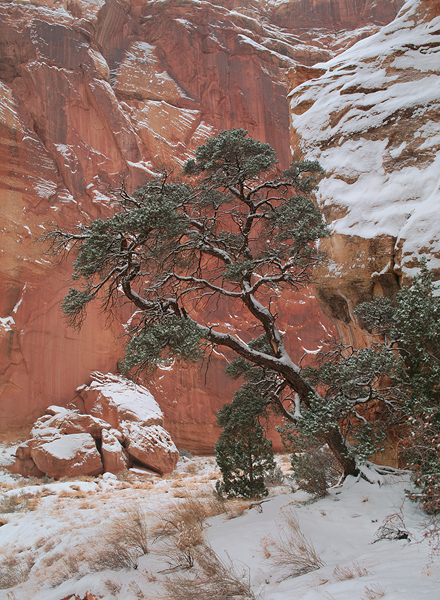 Leaning out from the far canyon wall, the isolation and dominance of a large pine drew me nearer. It extended away from a protective bulge of rock, forked into two large branches, and reached searchingly through the air. Deep green needles stood stark and resilient amidst the gnarled constellation of dead and crooked limbs. In the intense stillness the clearly audible sound of landing snowflakes whispered a soft, percussive chorus that seduced me into deep listening and quiet contentment in this enchanted, mystical land.